If you havea link you find is of interest, please email me at info@rdranch.net and I will add it to my list. Vanuard Plus 5 - Information from Pfizer Animal about the vaccine we use and why we vaccinate at 6 weeks. Please visit the RD Ranch Barn Sale and Gift Shop online store for great dog training books. 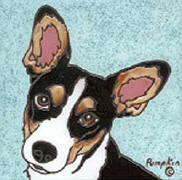 We also carry a beautiful line of handcrafted animal tiles including the Rat Terrier.